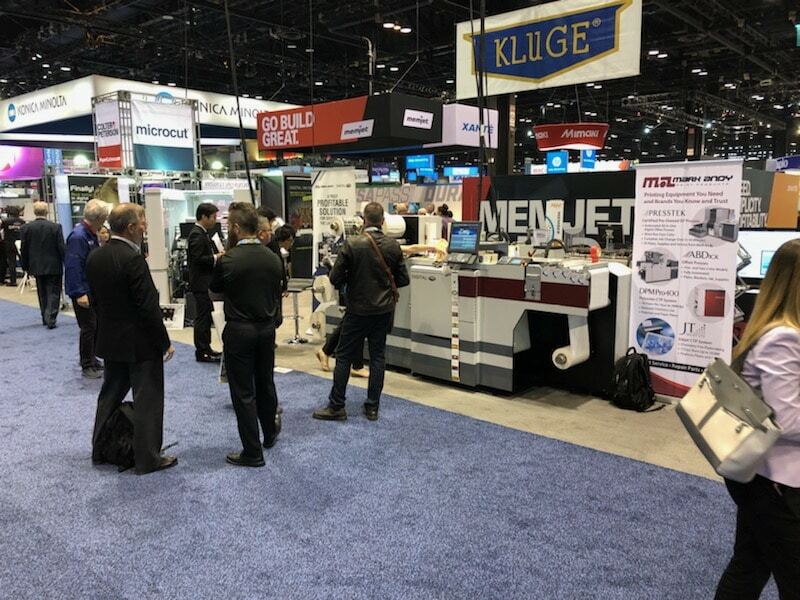 Attendees crowded Booth 1603 at PRINT18, as Kluge demonstrated their newest line of print finishing equipment. PRINT is the largest graphic arts trade show in North America and is held annually at McCormick Center in Chicago. Each year, Kluge brings its newest and best equipment to PRINT so that booth visitors can witness firsthand how Kluge continues to meet the ever-changing demands of print finishing. PRINT18 proved to be a great place for attendees to ask technicians and salesman questions and take advantage of their expertise to learn about new advancements in die-cutting, foil stamping, digital foil transfer, and folding and gluing. Kluge demonstrated their ApexFoil, which was launched at PRINT17, as well as the Digital Metal and the fully modular converting OmniFold 3000 Folding and Gluing System. Mark Andy successfully showcased their top-of-the-line Digital One press. As a bonus, visitors to the booth walked away with unique samples created right in front of them. Kluge is looking forward to continuing the relationships that began at PRINT18.